Any handyman or woman who works regularly with timber would benefit from adding the ONE+ planer to their tools and hardware collection. Whether you're making precision cuts, smoothing a door frame or planing a wooden cabinet, this handy tool will get the job done with excellent efficiency and a top-quality finish. A kickstand to protect surfaces from accidental damage. The guide on the base plate can add even more precision to your projects - you can also switch between 4 depth-of-cut positions to approach every challenge from the best angle. Find this planer, along with related accessories and other power tools from the 18V ONE+ System at your local Bunnings Warehouse. 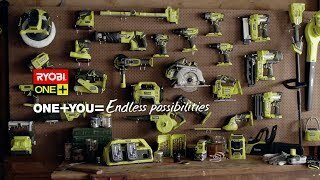 Use one battery to power over 50 tools - thanks to Ryobi.